Alien: Covenant improves upon its predecessor, making use of what worked and discarding the material that didn't. But it still falls short of the genuine terror that the first Alien film managed to fill it's viewers with and doesn't come close to the excitement that the sequel, Aliens, brought to the screen. Covenant begins as all previous Alien films began, by introducing the crew. And what sets them apart from previous Alien crews is they are couples, their mission to colonize a distant planet. After an emergency cause the crew to awake early, they receive a rogue transmission directing them to a planet that appears out of nowhere, and apparently fulfills all their needs. The films main stars are Katherine Waterson as Daniels and Danny McBride as Tennessee. Both give solid performances, but McBride is the sole supporting player who really makes any kind of impact. The real focal point of the film, though, is Michael Fassbender. As in Prometheus Fassbender again plays the android David along with the android Walter. Walter is a good deal more affable, his American accent less ominous than David's cut-glass English tones. Fassbender comes to dominate the proceedings and his scenes are frequently the film's most engaging. As for the aliens themselves, they're well done and beautiful, but still don't hold a candle to the practical Zenomorphs from the days of old. They are not the fully-formed xenomorphs that Ripley battles, at first, they are something in-between, with a familiarish look, lightening speed, and a new means of entering the carrier that doesn't make much sense once you think about. BUT after that we are introduced to two Zenomorphs that look like the Zenos that we all know and love. Unfortunately, that is the closest we get to feeling like an actual Alien film. Covenant plays great as a sequel to Prometheus, but as a prequel to Alien it just not there yet. 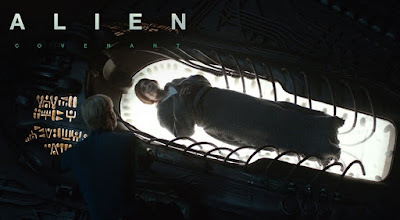 Covenant has a fantastic acting, a solid cast and a good script, it just that a few things that make this film work also rewrite the rules and history of the Alien franchise. It is well worth a watch, but if you were expecting a true Alien film, then you will be slightly disappointed.